In early January 2009 Frank and I, Carolyn, looked back over the prior year - reviewing our accomplishments and failures. We concluded that our most important accomplishment was to create our own small-business web site. Here is how it all came about. If you purchase from SiteSell through my affiliate connection to build your own business website, I will earn a commission. If you choose to enter their website directly, just enter http://www.SiteSell.com in the search engine of your choice. I am NOT compensated for recommending SiteSell. I do it because I believe in the product - if I didn't, I would not use it myself. SiteSell does not pay anyone for a testimonial about their products or services. For more information about SiteSell policies, please click the link below. For more information about earning commissions with a personal business website, please click on "Compensation" on the navigation bar on the left side of this page. SiteSell has no legal obligation under the FTC to make this disclosure. However, as owners of a SiteSell personal business website, we have come to expect no less from Ken Evoy and his team of professionals. I have watched Frank turn wood and build fine furniture for over thirty years. In June 2008, I approached him about creating a web site where he could share some of his knowledge about classic wood turning and fine woodworking with others who have a desire to work with wood, but lack the basic skills to become successful at it. My intention was to build a website that would make it possible for Frank to freely pass on what he learned from a master's training, and from sixty years of experience. My first step in setting up the site was literally to learn how to make the "first step." I thought it would be easy. I just went to Google and searched for "building a website." There were over 32,900,000 hits! I could build it for free, try it for free, be up and running in no time at all. I looked at one site after another. Then I went into a site that had a free tutorial for beginners. 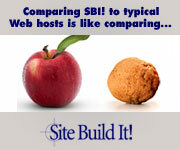 The site I entered had a video by the site's owner recommending a place called Site Build It! I watched the owner's video with no understanding at all of what I was seeing. So there I go - off to other sites. However, the more I looked, the more I was drawn back to the site with the video. Maybe I had better look at it again. This time I viewed the Site Build It! video. From there, I went to the Sitesell! homepage. At the bottom of that page, I saw a drop-down list where I chose to go to a page that compares Site Build It! with other web hosts. Here I learned that everything that I thought I was supposed to do was exactly the wrong thing to do if I truly wanted to create a successful small-business website. Build it for free? Try it for free? Up and running in no time? Sure - then become one more of the millions who waste valuable time and a lot of money on add-ons just to trod down the path to failure. If what I read on the Site Build It! pages was true, their site-building techniques would keep me from making a huge mistake. After I explored "I Love SBI!" and saw what others had accomplished and how positive they were about SBI!, I discussed what I had learned with Frank. We decided to Invest in Success and purchase Site Build It! - a decision that we have not regretted for a single moment (our cost for the first year is about 81¢ a day - one bottle of water a day costs more). "Introduction: The 10-DAY BIG Picture"
The introduction explains the concept of site Content which attracts Traffic who become Presold about you and your business who generate income by utilizing Monetization models. This is the you hear about often while you work your way through the Site Build It! 10-Day web building course. Day 1 of the Action Guide explains the basics of building a successful online small business. C-T-P-M is explained in depth. DAY 2 is where SBI! taught me how to focus our site's concept. I decided on our niche and then brainstormed it until I had developed our BEST site concept. When I reached DAY 3, I was ready to fully research our site's concept and determine how to mold it into a site content blueprint. On DAY 4, I was ready to begin planning our monetization models. The monetization techniques are important for deciding your site's profitability. This is not the implementation phase. Site Build It! will not encourage you to monetize before it is time for it - and they have very good reasons for the "wait period." The 4th of July, 2008! It took years of perfecting the SBI! Course for Site Build It! to get me to this point. (It took me a lot of work, too.) The great part is that every tool and piece of information that I needed to get here was right at my fingertips - even videos if I chose to learn by that method. They did it for me - they can do it for you! This is the DAY I began applying everything that I had learned - I entered the construction phase where I had to build content to start the "C-T-P-M snowball" rolling. But, of course, Site Build It! was guiding me every step of the way. The forums were also there for me to utilize. I found that most of my "newbie" questions had already been answered. All I had to do was search on my problem and, in no time, the answer was right there before me. I did not want to just supplement someone else's traffic - I wanted to build our own free traffic. Why pay for someone else to send you traffic just to have them stop? That stops your business, too. It might surprise you to know that very few online small businesses build their own free traffic, so they do not really own their businesses. DAY 7 teaches you how to really own your online business. To learn more about the rewards of building your own traffic, take just a few minutes to watch this video. Free traffic will do business with you if they trust you. That sounds simplistic, but it is as true today as it has ever been. DAY 8 taught me how to deepen our relationship with our traffic. Site Build It! does all of the technical work for you to create your, Blog, E-zine (E-magazine), forms, and videos. As our traffic volume began to increase, I needed to learn more about our visitors. DAY 9 showed me how to use all of the necessary tools to learn as much about our traffic as I could. That knowledge is necessary when you begin implementing the monetization model explained in Day 10. Day 10 is where the Monetizing part of the C-T-P-M philosophy comes in. You learn how to create a diverse monitization model so that your free traffic utilizes your links to find what they are looking for. Our young website began to earn income for us shortly after it went live. Ours is a very simply designed classic site - one that suits our style. With Solo Build It! you are limited only by your imagination. Every tool is available to help you achieve your website creation goals. In these days of economic hardship the world over, there is no better time than now to put your computer skills to work and build a prosperous online small business. If you want to learn more about the "It!" in Solo Build It! before going to the home page, just click on the video.